Eight years ago, two guys from Fort Worth quit their day jobs and started making whiskey. 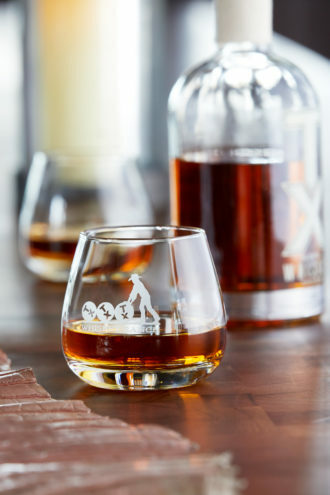 Now they’re opening the largest distillery west of the Mississippi—on a golf course. Amber Robertson wasn’t surprised when, one day in 2009, her husband came to her and said he wanted to quit his job. Troy was in oil and gas, on the finance side—a career, sure, but not exactly a calling. She knew he was unsatisfied. But leaving it behind to open his own distillery? Where did that come from? The distillery’s 45-foot copper column still and doubler, which was built with a window so guests can get a better look at the process. The timing was perfect for someone to get into the business—the craft whiskey market was still in its infancy, and Fort Worth didn’t have a distillery yet—but maybe someone else, not the Robertsons. Amber was seven months pregnant with their second child. As Troy told her about what he wanted to do, though, she could see this wasn’t some last-call dream. And she wanted him to be happy. “I mean, we spend more time at work than we do anything else,” she says. So, whiskey. OK, sure. She was in. With Amber on board, Troy set up a meeting with the team at Garrison Brothers, the first whiskey distillery in the state, to get a look at their operation. When he toured the facility, on a ranch in Hye, not far from Austin, he learned that someone else from Fort Worth was scheduled to visit the next week. A guy named Leonard Firestone, they told him. Leonard was stunned. He had been quietly exploring the possibility of opening a distillery in Fort Worth for the better part of a year. He’d only told his wife, Nicole, and only after he had worked up a solid proposal. Like the Robertsons, the Firestones had two young children, with another on the way. And his wife knew her way around a business plan—she had worked in private equity before leaving to raise the kids. But she was ready to leap into the unknown with him. “He made a very compelling case,” Nicole says. Firestone & Robertson Distilling Co.—the names in alphabetical order—was born at that lunch, and made official the next year. They were sort of a mismatched pair: Troy, a third-generation Texan who looks like he might ride a horse through a whiskey ad, and Leonard, a Maryland transplant who might be that cowboy’s accountant. But it worked. After raising startup capital from family and friends and whoever else was willing to take a chance on them, they quit their jobs (Leonard had worked in cable and broadcast TV) and went full time. Working out of a circa-1920s warehouse on Vickery Boulevard, south of downtown Fort Worth, they began experimenting, searching for the whiskey that would give Firestone & Robertson a reason to exist, while building a distillery. They were looking for two, really. They wanted a blended whiskey that was smooth and versatile, that could stand up to Scottish, Irish, and Canadian iterations. And they wanted a bourbon whiskey completely indigenous to Texas. That meant attempting something that hadn’t been done since before Prohibition, by Jim Beam. The government has strict regulations on what can legally be called bourbon. There are different ways to affect the taste—water, grain, the oak barrels used in the aging process. But Leonard and Troy discovered there was one that wasn’t tinkered with much: yeast. As much as 25 percent of bourbon’s flavor is derived from the yeast used in fermentation. Capturing wild yeast used to be common practice, but outside of the big names, most distilleries bought their yeast from the same labs. A Texas-born yeast is exactly what they needed to set Firestone & Robertson’s bourbon apart. Was that possible? They had to find a scientist. Bourbon trail: The Barrel Breezeway, a replica of the Firestone& Robertson rickhouse,leads to The TX Tavern, abar and tasting room. Rob Arnold was born into the whiskey business. He’s a Kentucky boy whose family had made whiskey for generations, some of it for Brown-Forman, the liquor behemoth in Louisville that owns Jack Daniel’s and Woodford Reserve. But he chose a different path, leaving to work toward his Ph.D. in biochemistry at UT Southwestern. He looks the part, somewhere between professor and student, a boyish face hidden by a beard. You can’t always change what’s in your blood, though, and after a year or so at UT Southwestern, Rob felt the pull. He started thinking about using his science background to make whiskey. Like Leonard and Troy, he began looking into starting up his own distillery. But he was a scientist. He didn’t know the financial side. That’s why he initially approached them. Through his conversations with other distillers, he had heard about what they were up to in Fort Worth. Rob found Leonard’s Gmail address—he doesn’t remember how—and made him a proposition: you give me advice on how to raise money and I’ll give you advice on how to make whiskey. After a few meetings spent getting to know each other—nothing serious, just sharing their thoughts about whiskey—Leonard and Troy had a counteroffer for Rob. Come be our head distiller. Make bourbon for us. They also had a question: did he think he could capture a wild yeast from somewhere in Texas? “I didn’t really know, but I wanted the job, so I said, ‘Yeah, sure. I can probably do that,’ ” he says. In grad school, he had isolated marine bacteria from ocean sediment. He figured that wasn’t far off. It was all microbial isolation. He left UT Southwestern early and signed on with the company. Then he began the hunt. Locating yeast is not difficult. You can find it on fruits, nuts, seeds, and the soil around trees, especially, but it can be found almost anywhere. There are some theories, Rob says, that its true home is on the bark of trees that come from the same order as oaks: “A weird little connection to oak barrels, not that it means anything.” But not all yeast is suitable for fermentation. What he needed was a species of yeast called Saccharomyces cerevisiae, also known as brewer’s yeast. The search took him to Rancho Hielo Brazos, a ranch in Glen Rose, where he spent most of a day collecting samples with the ranch manager, Rhett Johnson. Rhett was another scientist, the rare cowboy with a background in botany. His deep knowledge of the ranch’s flora made it easier, giving Rob a map instead of just a destination. Rob brought his samples back to a lab at TCU. One of Firestone & Robertson’s investors is a friend of the school’s chancellor. Through that connection, Leonard and Troy were able to secure him lab privileges. (Eventually, to make it even easier, Rob became an adjunct professor.) He isolated about 100 different yeasts and, using DNA sequencing, narrowed down that list to 11 potential candidates. Five of those held up during small-scale fermentation. Then it was a matter of preference. During a series of blind taste tests, Leonard, Troy, and Rob all picked the same strain. It hailed from a sample Rob had collected from a pecan nut near a building at Rancho Hielo Brazos they called The Saloon. It gave the bourbon a roasted sweetness, with cinnamon, spice, and dark fruit flavors. They named the strain Brazos in honor of its birthplace. Further DNA sequencing at TCU revealed that Brazos originates from a different lineage than the European yeasts that came over when people brought their whiskey and beer and wine strains to set up shop in America. It was another bit of serendipity in an origin story that repeatedly strains credulity: two neighbors separately decide to open a distillery at the same time; they find a scientist who happens to have a long history in the whiskey business; he finds the key ingredient for their Texas bourbon whiskey in a pecan. There are fairy tales with more plot complications. Belly up: The TX Tavern features light fixtures made with TX Whiskey bottles and memorabilia from the property’s former life as the Glen Garden Country Club, where Byron Nelson and Ben Hogan got their start. In the spring of 2012, Firestone & Robertson was ready to debut its first product, TX Blended Whiskey. They had fine-tuned the recipe over two years, sourcing it from various whiskeys, with Texas’ climate adding an extra touch. Blends are all about finding the right combination, then staying on top of it, sorting out the subtle changes from year to year and barrel to barrel. They filled the bottles, too, huddled together around a little four-spout gravity filler. “On a good day, when we were just rocking and rolling, we could make a full pallet,” Troy says. Leonard and Troy had no idea how many bottles they would actually need. All they had to go on was what their distributor, Brent Lewis of Southern Glazer’s, told them. Lewis—who sought them out after seeing the positive press heralding the arrival of Fort Worth’s first distillery—said that, since they were a new brand at a premium price point ($40), they’d probably sell a couple hundred cases, about 1,200 bottles, in the first two or three months. That would be a good start. Lewis laughs at that estimate when he is reminded of it today. The distillery’s first shipment of 750 bottles, released at the beginning of June of that year, sold out immediately. Many didn’t even make it to shelves, going to customers on waiting lists at liquor stores around Dallas and Fort Worth. The team stayed up all night around the gravity filler to produce almost 700 more bottles the next week. Those, too, sold out. And so it went. By the end of its second month in stores, Firestone & Robertson had sold more than 7,000 bottles of its blend. It wasn’t merely a commercial success. In March 2013, TX Blended Whiskey was named Best American Craft Whiskey—along with receiving a Double Gold award—at the 13th annual World Spirits Competition. The contest, held in San Francisco, drew more than 1,400 entries from 63 countries. Firestone & Robertson expanded its distribution into Louisiana, then Oklahoma. 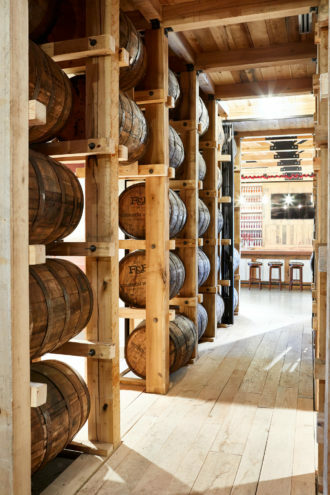 All the while, their bourbon was aging in newly charred 53-gallon white oak barrels at the distillery in south Fort Worth, flavored by their Brazos yeast and the brutal summer heat. That is the difficult part about starting your own distillery—the waiting. Bourbon, by law, has to age at least two years. After almost five years in the barrel, it was time: Firestone & Robertson announced the first bottles of TX Straight Bourbon Whiskey would go on sale December 12, 2016, at the distillery. Leonard and Troy expected maybe 300 people to show up. That would be a good start for a new product. At 6:30 am—long before the doors were set to open and with temperatures in the low 30s—there were already customers in line. Just a few at first, and then a steady stream. More than 1,700 people eventually turned up that day, though only 750 were able to buy a $50 bottle of Fort Worth’s first straight bourbon. Firestone & Robertson had to cap the line or else the distillery wouldn’t have enough to fill retail orders. That brings us to Whiskey Ranch. An aerial view of the Whiskey Ranch compound. On a brisk Tuesday morning the week after Thanksgiving, Troy Robertson is showing a guest around what used to be Glen Garden Country Club, in southeast Fort Worth, the club built in 1912 where Byron Nelson and Ben Hogan started out as caddies. It’ll be the only distillery located on a functioning 18-hole golf course when it officially opens in March. They’ve already been hosting tours a few days a week, and the combined Firestone and Robertson families, more than 50 people, celebrated Thanksgiving here, Whiskey Ranch’s first big event. When Leonard and Troy acquired the property in 2014, they weren’t looking for a golf course—it’s still there, with the No. 5 and No. 7 fairways rerouted to make room for their operation—just somewhere with enough space. At least a couple hundred acres to accommodate what they wanted to do. It almost didn’t happen. When they announced their intention to buy the 112-acre club, more than 2,000 of their new neighbors signed a petition opposing the new zoning necessary to locate a distillery on the property, worried about traffic and liquor being sold there. They held meetings and prayer services. But Leonard and Troy were able to convince a supermajority (seven of nine members) of the Fort Worth City Council to vote their way in July 2014, after saying they planned to reinvest $15 million in the grounds and give the city a place that rivaled the Kentucky Bourbon Trail. They bought the land in December of that year and went about building Firestone & Robertson’s dream house. It took more than a year to design and another 15 months to build. The result lives up to their promise to the City Council. 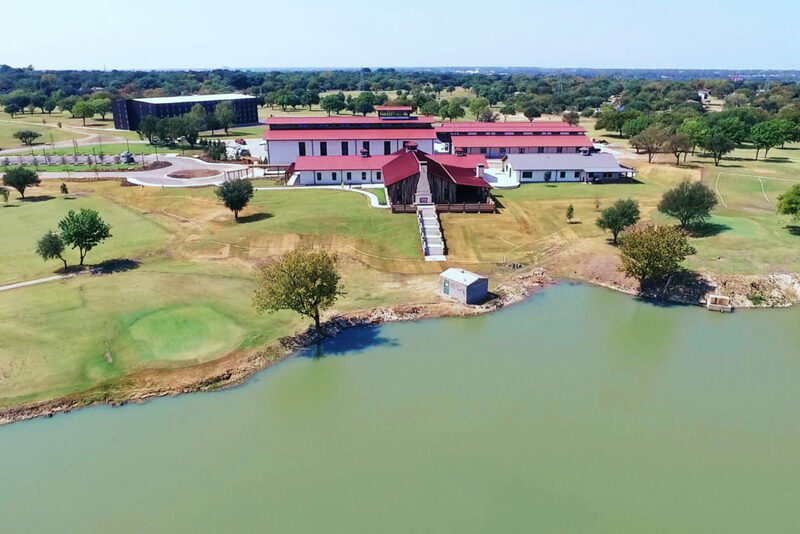 Set back far from the entrance, at the end of a meandering road, the compound overlooks a lake on the new 18th hole of the golf course, with a sweeping view of downtown Fort Worth at the back. The Ranch House, the main visitors building, is all dark wood and stone, with a wraparound patio and a large, new event space—called The Oak Room, with a capacity of around 400 standing and 180 seated—that has a manor fireplace and custom-made steel ornamentation. To get to The Oak Room, guests walk through the Barrel Breezeway, a replica of their rickhouse, complete with a floor raised so the clicking sound mimics what you’d hear walking among the barrels at the original. “That was an engineering feat,” Troy says. As he clicks through the Breezeway, Troy stops next to one column of barrels and hits a switch. The barrels slowly rise, revealing a door to a hidden room. Inside is a large round dining table with a glittering chandelier hanging above it. On either end of the room, floor-to-ceiling glass cases contain Leonard and Troy’s private collection of whiskeys from around the world. “This Nikka whisky, single malt, it’s not made anymore,” Troy says. “So that bottle there is in the thousands of dollars.” It’s something like whiskey heaven. They bought the land in December of that year and went about building Firestone & Robertson’s dream house. It took more than a year to design and another 15 months to build. 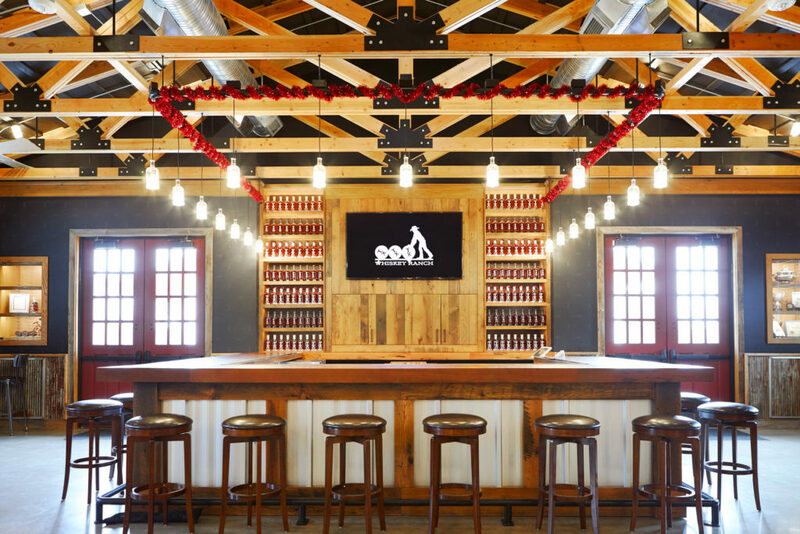 In addition to a retail space and a place where visitors can make their own boot-leather bottle tops, The Ranch House also has The TX Tavern, where they’ll have tastings and serve cocktails on a limited basis—the law allows them to serve only 3,500 gallons a year. It’s a proper bar, with reclaimed wood, some memorabilia from the Glen Garden days, and light fixtures made from TX Whiskey bottles. The TX Tavern and everything else in The Ranch House is ready to go. The real reason for Whiskey Ranch is close. Troy walks next door to the production facility where the showstopper of the tour is being installed: a 45-foot copper column still. 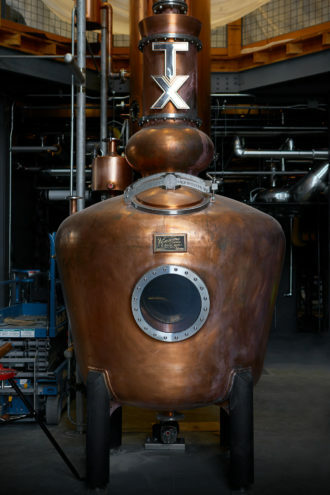 It’s flanked by two wide staircases and fronted by a squat copper doubler—a pot still used for the second distillation—the first designed with a window so people can get a closer look at the process. The building also includes five 16,000-gallon fermentation tanks (with room for a couple of more), which will allow Firestone & Robertson to call it the biggest whiskey distillery west of the Mississippi. The tanks might be the least exciting part of the tour, but they are the most important part of the entire place. The four deep-water wells on site will help with the production process, maybe even deepen the flavor. The presence of The Oak Room and The TX Tavern means Firestone & Robertson can start hosting events again, a pursuit the distillery had to abandon three years ago when it ran out of space. The golf course, the view, the secret room, everything else—it’s all great. But those five tanks mean that Firestone & Robertson’s production capacity will jump from nine barrels a day all the way to 120 when the operation moves over here sometime in the first quarter of the year. (The 901 Vickery location will be used to make small-batch, limited-release whiskeys.) That means distribution will be able to expand from 14 states to all over the country, maybe internationally. Those five tanks mean the fairy tale continues.